Edition Details: 1st p/b edn. Paperback. SIGNED. A Documented History of the Whitechapel Murders of 1888. A full and fascinating detailed reconstruction of the crimes of the Ripper and of the subsequent police investigation. The author follows the events in chronological order and makes extensive use of contemporary testimony, tracing the story from 1888, when the crimes were committed, to the 1980s, when police files were closed on this horrific chapter of British history. 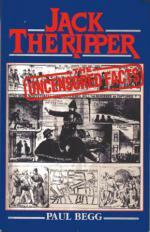 A definitive book on Jack the Ripper that examines the backgrounds of the victims, the circumstances of the crimes, and acclaimed as an absolutely indispensable classic. Illus., Appendices, Notes and References, Bibliog. and Index. 256pp. trade size softcover. With tipped-in label SIGNED BY PAUL BEGG. Lightly browned edges,. Vg. Recommended, particularly for those people just starting out on the quest for 'Jack'! 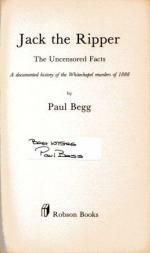 Paul Begg was a contributor to the Grey House Books publication 'Who Was Jack the Ripper? A Collection of Present-Day Theories and Observations'.